Fantastic review on the VW Up, Part 1 and 2 are now officially posted. We test cars on your behalf, so we save you the time needed to decide on what to buy. If you are on your first salary, or even your 3rd, this is the right car for first time buyers! 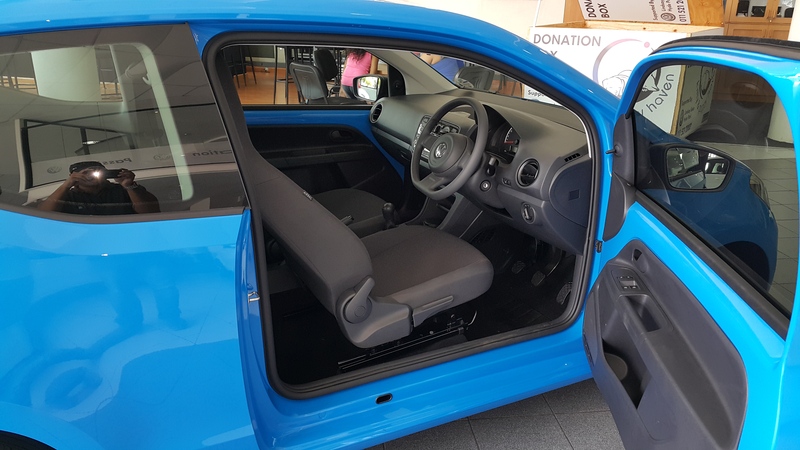 We had the privilege of driving the new VW Up at Lindsay Saker Hyde Park this past weekend. They had an open day at all their branches, launching the new VW Up. By now, if you are one of our regular 294+ readers, you may know that I am a little OCD about customer service. We get the chance to meet many dealers and many sales people, and it`s not often that they actually get it right from the get go. In this instance, this past Saturday, we had a very positive engagement with Loricke Nienaber of Lindsay Saker. She is a Sales Exec at Lindsay Saker and a breathe of fresh air when compared to some of the dreary folk we have had to meet in the past two months. The VW represents VW`s stab into the micro car segment. In comparison to the Honda Brio, Hyundai I10 and Fiat 500. Without driving any of the other cars that fall into this segment and for this price range, I am nearly sure the VW will win hands down. We did drive the Fiat 500 recently, and compared it like-for-like against the Opel Adam in our recent 5 car test. Knowing just how bumpy the ride was, down William Nicol in the 500, I took the VW down the same route and was wonderfully surprised! I had a friend of mine sitting in the back seat – and he managed to fit in comfortably, even with my seat placed in my usual driving position. The car was great! 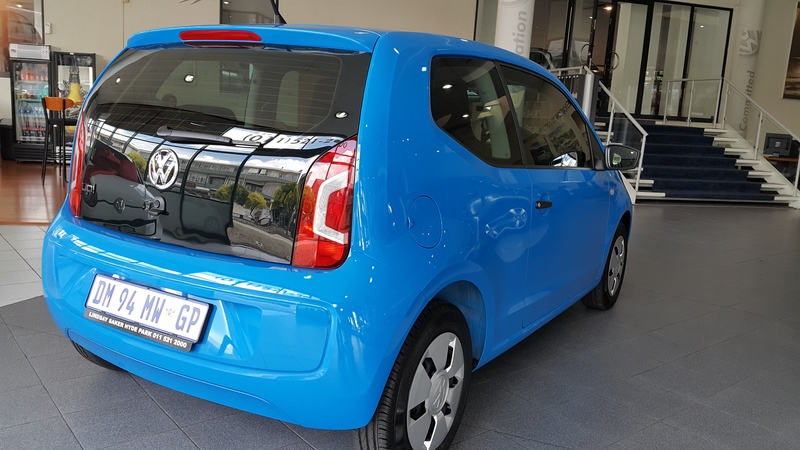 Loricke took us on a quick test drive around Randburg and back, which brought out all the VW Up`s good and bad points. Believe me, there are more good points on this car than bad. With really good driver feel, great clutch; brakes and gearbox, the car felt a lot more together than the Fiat 500 we drove 3 weeks back. The engine is only a little 1 litre, and this time with no turbo for a little more oomph. What we did like, was that this car didn’t pretend at any point to be something it`s not. And this brings me to a quick analogy of what the UP actually is. It`s not a Polo and it`s not a little i10/Brio/500. It is not trying to punch above its weight, but it is absolutely desperate to please. There is loads of room and I felt very comfortable driving it! There is over 200 litres of space in the boot – and this all within a car that is only 3.54 metres in length. For those of you trying to navigate parking in shopping malls, as we do often in Johannesburg, parking this little beauty is a dream. There is space for 2 people in the rear, and while driving I thought of how many students and 1st time car buyers will feel right at home in this great small car. I like it when brands are honest about what their cars are, and VW have always been right on the money. It’s the reason why so many people love and trust the Polo/Vivo and we can see it in all the reported NAMSA sales every single month. If you are a parent, and need a car for your student kid, this would be just great. If you are also starting your first job- or even your 7th, this is a great way to get to work /varsity/gym/church and back. It is very plain inside, with a few optional extras in terms of more speakers, sunroof and black gloss dash inlay. As I said before, this car is not pretending to be a cutesy little 500. Even though the interior is not particularly special, it does come with a 5 STAR EURO NCAP rating and was rated 2012 World Car of Year. Who are we to argue with the world? Those 5 stars beat Mini, Opel Adam and the Fiat 500, which are all at, or much higher than this pricing bracket. Prices start at R 133 500 for the Take Up! And R 140 500 for the Move Up! which is the slightly higher spec of the two. We still need to test the car for an extended period of time, to see if we can pick up any faults or niggling thingys. In the interim go see it for yourself! If you need a car – even if not in this price bracket – go take the new Up for a spin. 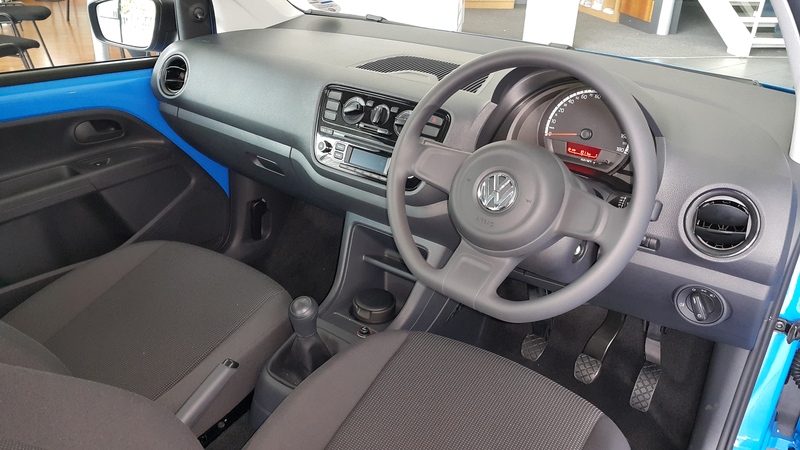 Call Loricke Nienaber on 011 521 2000 or 073 727 2381 for a test drive at Hyde Park VW – just on Jan Smuts. This entry was posted in Car Review. 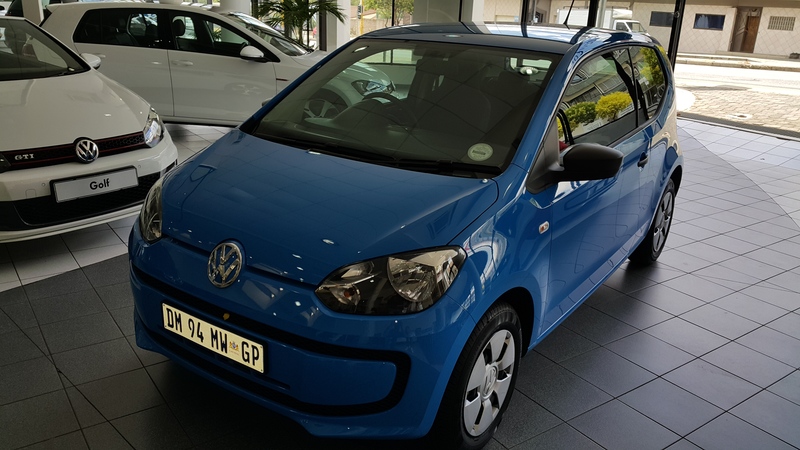 Tagged Best Small Segment Hatch, Customer Service Review, Johannesburg, Lindsay Saker Hyde Park, South Africa, Test Drive, VW South Africa, VW up. I love this! I wish I would have waited for it!!! It’s never too late. What do you have now? Driving a 2013 polo vivo Oh Yea! Great car. I have had 2 polo hatch company cars. Comfort line 1.6 was great!